Next weekend, the Southbank Centre aims squarely at the most unknowable of taboos with a festival dedicated to death. The Grim Reaper; the Fourth Horseman; Thanatos; the Ultimate Equaliser; The Blessed Release; as A Sachs said, "Death is more universal than life; everyone dies but not everyone lives." So why so squeamish, people? The Southbank’s Festival for the Living includes music, workshops, literature, installations and talks, aiming to encourage those of us who aren’t poets, or 90, or attending a funeral next week, to actually take some time to think about death. Highlights surely include the Fabulous Coffins from UK and Ghana; Paul Gambaccini’s Desert Island Death Discs; Markus Birdman’s A Stroke of Luck and Sandi Toksvig’s Memorial Lecture. For just £12, a Festival Day Pass gives you access to a range of talks, debate and performances including Assisted Dying – The Human Rights Debate with Jon Snow, poet Christopher Reid discussing A Scattering, and 27: The Age The Rock Star Died by Paul Morley. Peter Pan thought dying would be "an awfully big adventure". If, like us, you’re not quite sure this is true, take a listen to the Southbank’s Deathcast, below, and see if it rouses your adventurous spirit and inspires you to go along to this, it has to be said, slightly strange event. 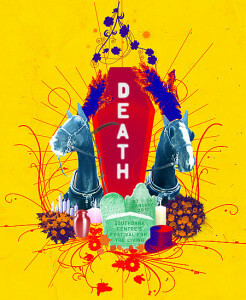 Death: Southbank Centre's Festival For The Living takes place between 27 and 29 January. Visit southbankcentre.co.uk to find out more.